Roz Box is a super-stylish and secure way to transport up to 68 oversized pastel sticks! It's equipped with two plastic organizer trays with foam inserts for the ultimate protection. Each tray holds up to 34 Unison Soft Pastels sticks, each measuring 2.875" long and 0.75" wide. 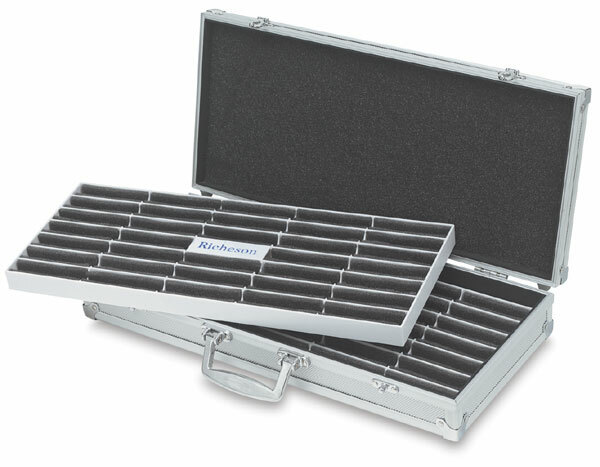 The lightweight brushed metal case measures 17½" W × 7½" H × 2¾" D when closed. It provides secure clasps and a handle.